Cucumber is in the fridge and I got to make this Chicken Kurma. Kurma I would say is the least spicy when it comes to the family of spicy food. It is mainly made of cumin and coriander I think. I never really know what it is made off as I can buy those Kurma powder in a packet easily. For non professional cook like me, to determine how tasty your dish would be is to get the right brand of Kurma powder. I’ve brought with me a packet of brand that I am not familiar with. I normally use Baba’s but since I was given this powder by a friend from Malaysia, I might as well try it. You can actually use other types of meat when you cook Kurma. It can be beef, mutton or chicken. 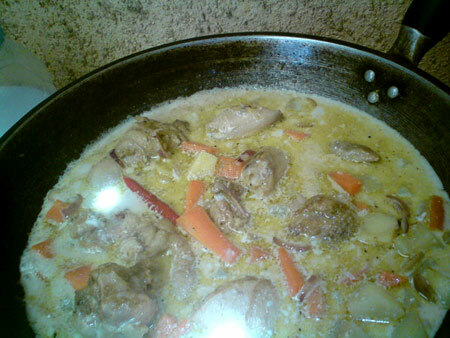 Since I have chicken available I will just make chicken kurma. The method is almost the same but is just the cooking time is different if you going to use beef or mutton as the meat takes longer time to be tender. 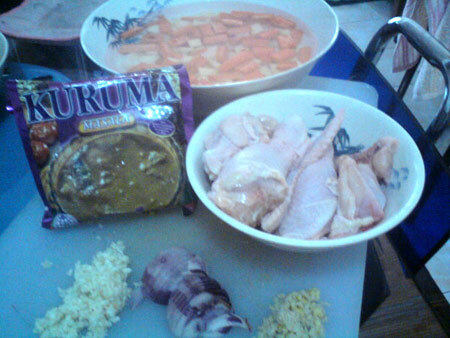 So here are the pictures for the ingredients needed for Chicken Kurma. Today I was really in the mood to cook up a mini feast. I even bought 2 pieces of dried fish ( toyo ) and just fry it. It is another good agent or combination to eat with Kurma or Curry dishes. So today lunch is very lavish for me at least, as I have some really nice gravy of chicken kurma, cucumber salad and dried fish. 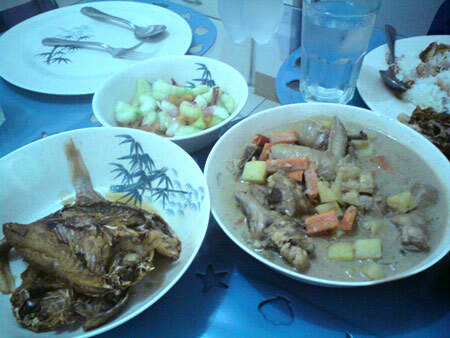 For those of you who are reading my blog and would like to try to cook this dishes but could not find the necessary ingredients like kurma powder, I hope you will be patient as I am finding a way on how to make all these ingredients available in the Philippines for very affordable prices. In the meantime, I’m gonna have a hearty meal for lunch today while watching WOWOWEE. looks quite “pro”…n yes the pictures looked a bit not sharp…keep up the cooking. Thanks for the kind words…maybe one of this days you can take some picture of Lean Chea’s cooking.